Yes, we're in the home stretch now! We've finalized a date: Sandvox 2 will ship Tuesday, May 10th. Repositioning and resizing objects (such as images or movies) will be much more fluid and natural. Just drag things around to move them! We've merged the capabilities of the “Regular” and “Pro” editions of Sandvox: now everybody will get to make use of Raw HTML and the Google Tools integration that previously required a Pro license! And, as before, we have a 60-day, no-questions-asked money back guarantee. If for some reason Sandvox 2 is not what you thought it would be, just let us know and we'll cheerfully refund your money. Sandvox 2 will retail for $77 US, with an introductory price of $67 for the first ten days after release. But for members of this mailing list only, we are providing the best price possible for a new license to Sandvox. On Tuesday, we will send you a coupon code that will take the price down to $49 for a single-user license to Sandvox 2. But that price will only be good for the first 48 hours, so you will need to act quickly to get this special deal! Note: If you already have a license to Sandvox 1.x, you’ll be able to enter your original license key on our web store to get a specially discounted upgrade price. So watch your email inbox this coming Tuesday for the announcement of Sandvox 2's release and your special coupon code. We’re very pleased to announce that an update to our free iMedia Browser is now available from the Mac App Store. This version continues to build upon the new 2.0 architecture which we introduced in January of this year. Besides fixing a number of minor issues, this first update contains important improvements to browsing iPhoto, Aperture, and Adobe PhotoShop Lightroom photo libraries. 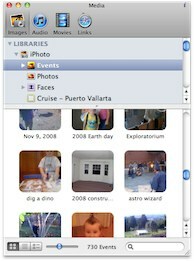 Now in version 2.0.1, you can skim your iPhoto Events the same way you do in iPhoto itself. We've also added support for "Faces" to both the iPhoto and Aperture browsers. Finally, this update now supports Collection Groups in Adobe Lightroom 3.